Below is a short but interesting and informative video lesson presented by Matt Fussell from thevirtualinstructor.com. 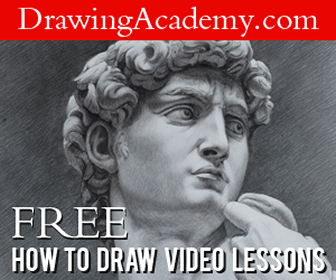 This video will discuss and demonstrate 4 important pen and ink drawing techniques that every artist should know. Matt uses pen and ink as his medium in the video tutorial below, but you can use these same techniques with other drawing mediums. Hatching is a technique where closely spaced parallel lines are drawn to create various values in a drawing. You can make something appear darker by drawing your lines closer together or by making a thicker line. The farther apart your lines are, the more white space will show, creating lighter values. The cross hatching technique is similar to regular hatching only you are using more layers. Instead of drawing your lines in only one direction, you are varying the angles at which they are drawn. For instance, you could start your lines horizontal, then draw a set of vertical lines over that, then a set of diagonal over that, etc. The random lines techniques is just as the name suggests really. You simply create a series of random, overlapping squiggly lines. This is a great technique if you like to be more free with your drawing as hatching can be a bit too structured for some of us. This technique is where you apply a series of small dots. The closer together the dots, the darker the value. This is probably the most time consuming of these four techniques, so it does require some patience. Although it is very time consuming, it does offer a great deal of control when it comes to range of values. When stippling is done with colored inks it resembles the painting style known as pointillism. Freshly retired, I’m looking for a style of pen and ink that appeals to me. Is there a name where the subject of drawings are surrounded by little circles as if they were standing on/in small stones? It has intrigued me since I first saw it in a book as a very young child. Really very Nice, I liked it. Let go and Express Yourself with Charcoal!